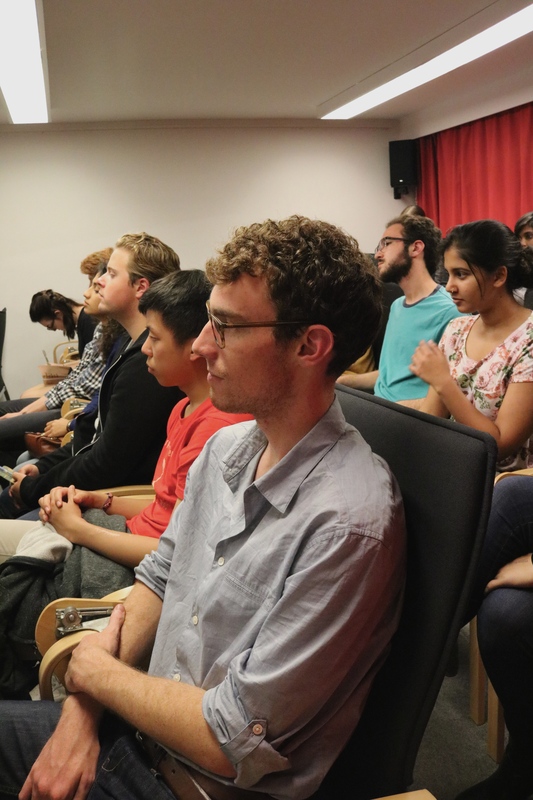 On the evening of Friday, September 18th, in a residential neighbourhood on the fringe of one of the world’s most vibrant cities, something odd occurred at Bard College Berlin. This is a time when one might expect the students of BCB to be out and about the city, or simply doing their best not to think too deeply for a while. And, indeed, most of the classrooms were empty: doors locked, lights off, lying in wait of Monday morning. Curiously, though, on this night, light and sound filled the school’s lecture hall. 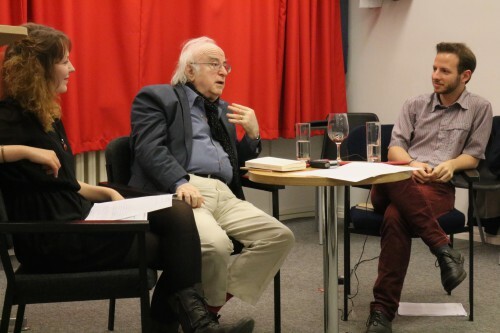 Students, professors, and some of the English-speaking residents of Pankow had come for “A Conversation with Norman Manea” – the renowned author of various politically and socially charged novels, essays, and short stories. Norman Manea was born in 1936 in Romania, in the province of Bukovina. At age five he and his parents were deported to a concentration camp in Transnistria, and at age nine he returned to Romania with those members of his family that had survived. Despite these extreme hardships in his early life, Norman Manea went on to excel in high school and graduated with a Master’s degree in engineering in 1959. It was in the 1960s – despite the censorship laws that were in place – that he first began to publish writing critical of the Romanian communist dictatorship under which he lived. His work was both suppressed by local authorities and extolled by his contemporaries. After years of clash with his government, Norman Manea went into exile in the United States in 1986. Since then, he has been working as a professor and writer in residence at Bard College in Annandale, New York. This was the second time in 3 years that BCB was able to host him for an evening of conversation. The first time was shortly after the publication of a book of his essays. This year he came to Berlin mainly for the International Literature Festival, which presents contemporary authors and their works, but was happy to pay the school another visit. The evening opened with a reading from his volume The Fifth Impossibility: Essays on Exile and Language (2012, Yale University Press). Manea did not read the pieces himself. Instead, he had asked ahead of time that BCB students read the pieces on his behalf. He felt this would assist in creating an atmosphere of conversation right from the start. The voices of the students rang clearly from the podium, his words – momentarily theirs – painting a picture of struggle, hope, and identity. All the while, Norman Manea sat in silence at the front of the room, a wry smile occasionally lighting his face as he surveyed the audience. Then it was time for questions. Inasa and David, two fourth year students at BCB, moderated the evening. They picked up the conversation with a prepared response each that opened up the later discussion with the whole audience. David began with a difficult question relating to translation, asking Norman Manea to consider the role of the translator in contrast with that of the writer. In his essays, Manea had likened the writer in exile to a snail that carries its language around with it like a house, leading a fragile and barely mobile existence. How, asks David, does this compare to the translator, who is also moving between and attempting to create bridges between languages? Up until then, Norman Manea’s written words and their interpreters had done the speaking for him. I was curious as to how his voice would sound. Would it be the same as the voice of his writing? He spoke. “The translator is a very important character in the history of culture,” he said sagely. “Without him or her [performed communication between languages] is not possible.” However, translation is a “complicated process” as “literature is not only about information” but “beyond information.” Nonetheless, we must profit as much as we can from it, he said. He spoke of his adolescence and the translated works he read then. He spoke of the struggles of being linguistically a “deaf-mute” when in exile, who, when he got homesick, would visit his “friends” (books) in the library: “And there [they are]… but in another language”. His voice was not the same as that of his writing: There was greater depth to his speaking. Perhaps it is because the words from his mouth were fully his own – not interpreted and translated into English by another – that I was enchanted by what he had to say. But I suspect his thoughtfulness and his musical Romanian accent played a role in this, too. “To me, Aspirin is the symbol of globalization.” (Ubiquitous, without language or religion, I suspect he’s correct). Occasionally his wife, seated in the front row, would interject to correct him on some detail he had forgotten or mistaken. “It’s a blackboard, not a table,” she said laughingly when he innocently confused the two. It is easy to understand the mix-up when we consider the Romanian word for blackboard is tablă. By the end of the evening, the atmosphere was one of familiarity. As we exited the Auditorium to be received by wine and quiche in the entrance hall, I lost sight of him. We, the audience, were able to speak freely of our impressions– unanimously positive. Though none of the questions we asked received a direct answer (as their nature did not lend themselves to one), there is no doubt that much was learned from this extraordinary man – and that there is much to be learned further. I think I speak for everyone there when I say we are grateful for an evening of enlightening conversation, and that BCB would gladly welcome him back for more.